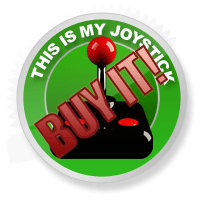 Minecraft Review - This Is My Joystick! You know that object that’s been in your parents house since you were born. You’ve grown up with it and you’ve never questioned its existence in the house, until one day, when it caught your eye for a really unexpected reason and you asked your parents where it came from and they told you how it has a long, deep and rich history? That’s what it feels like reviewing Minecraft. Apart from the rich, deep history, it’s been sat on my computer for a couple of years now, to a point where I haven’t really questioned its presence until Mojang officially ‘released’ it at Minecon. Oh yeah, you’re a game, aren’t you, Minecraft? Forgot about that. What does this actually mean for us, as Minecraft’s players? Not much, apparently. New versions of the game will still be released sporadically with new features and added extras, and as such, the game won’t lose the in-development feel that it’s had, except for the fact the ‘Beta’ notification has been taken out of the top left of the screen. Rule #1: Monsters = Bad. 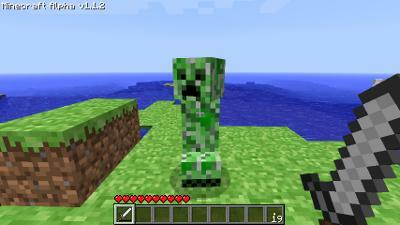 For those of you that have been living under a non-pixelated rock (the ones in real-life, not the ones you’ve carved out of generated mountains), then you should know that Minecraft has no storyline apart from the fact that monsters want to eat your eyeballs and you must fend said monsters off. These monsters only appear in dark places such as caves, or at night, and will inexplicably spontaneously combust if they hit sunlight. Apart from Creepers, who sneak up on you and blow up. Why do these monsters want you dead? Because they are monsters, and that’s all they do. I’m voting for the patch where we see the history of the race of Zombies or the background to the Creeper species and find out that they were brutally mistreated in past times by Humans, sold into slavery and abused. These few pixels will become your worst nightmare. That may not be a great idea, sure, and that’s also a good thing. Personally, sandbox games, which I suppose Minecraft falls into, work well with nothing tying you down. With no commitments comes true freedom. Games such as Fallout 3 that boast large terrains with hours of gameplay get lost when you’ve been anchored down by a plotline that only takes you through ten percent of the game. However, with the inclusion of the Ender Realm and the Nether means there is more than enough ground work for a storyline if Mojang ever wanted to include one. Which I heartily hope they don’t. 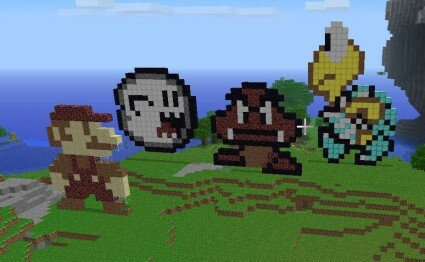 It’s a simple rule of Minecraft that if you’re not creating something, then you’re doing something drastically wrong. Whether that ‘thing’ may be a hole in the side of the mountain or a deconstructed, yet life-size model of the Eifel Tower, that’s the name of this game. To help you along your crafting journey, you’re given the ability to craft a multitude of tools and methods to build houses and structures and dig out the land. As such, Minecraft’s gameplay is what you make it. Instead of telling you what to do, it will land you in the middle of some unexplored land with not even a good luck. Fend for yourself or die trying is the name of this game. Make your own mark. The two obvious differences are that you can play in Normal mode, which includes monsters, normal mechanics and typical crafting for the gameplay element, or you can play in Creative Mode, which allows you access to all the game’s blocks to build whatever you want, no monsters and the ability to fly for those bigger constructions. However if you’re not the most creative of people, there is the ability to download other people’s maps and play them. With the inclusion of an in-game item called Redstone, people can make working contraptions that allow for intense puzzle making and solving, and even some storyline if executed well enough. Rule #3: Pixels can do anything. The most beautiful part of this game is that it doesn’t try to wow you, or pretend that it’s a AAA title piece of art. Minecraft works with the basics, the blocky graphics working in sync with its blocky gameplay, delivering an easy yet pleasing experience for the eye. Whilst the game is in low-def, if you’re looking for something smoother then that’s not a problem. With a community full of people developing texture packs and themes that span from unique to branded (such as Sonic themed) you can make Minecraft look exactly how you want it to. Invest enough time and you’ll be playing an entirely unique Minecraft experience, or just steal a nice one you see online. Either way! It's a game within a g... okay, I'll stop. Rule #4: Hissing means you’re screwed. Sound is an interesting element in Minecraft. There are a few soothing music tracks that are played in the background periodically that don’t seem to have any strict timing as to when they grace your ears. Because of this, you could be departing on an epic expedition in complete silence, or spelunking through a cave with monsters at every turn with peaceful melodies. Sound effects on the other hand are quite in-depth, with bubbling, stone crunching, burning, swimming, jumping and dying. All of them combine for an immersive feel that adds to keeping you hooked. Minecraft has the best of both worlds. It’s a fantastic game to listen to your own music whilst mining away, however if you’re wandering at night or traversing a cave, I highly suggest listening to the game. A twang of a bow or the hiss of a creeper could save you from a highly unwanted death. Rule#5: Hammer. All over that land. Probably the best point of Minecraft is that you can go online and share your experiences with others. Through servers, you’re able to get together with friends or strangers to build structures together online. Many servers focus on letting players build their own towns and structures in an orderly fashion. Well kept servers with rules usually flourish into fantastic communities, whilst ones left to themselves fall prey to broken communities and griefers; people who purposefully go around to destroy people’s work. As such, server choice will really affect the experience you have online. Not only that, but the online world of Minecraft has developed its own online lingo and community that doing a bit of research on terms and ‘celebrities’ probably wouldn’t hinder. The ability to get together in groups has had amazing effect, however, with people banding together to create jaw-dropping buildings, replicas of famous buildings, such as Hogwarts Castle, and literally creating communities. Minecraft has the MMO effect, in that it can envelop your life. With so many chances and ways to be engrossing it can quickly drain away hours before you realised what exactly has happened. With all the unending opportunities, it’s easy to substitute Minecraft over other games. Hence how Minecraft can become overwhelming. If you don’t like giving in, then you may want to think twice before tackling that death-defying build that will take you several months. Getting attached to Minecraft can lead to not wanting to let go easily. Addictions aren’t always bad, however, as long as they’re kept under control. Minecraft hasn’t revolutionised indie gaming by sitting on its arse. It has kept pushing the barriers, listening to its fans and giving them what they want. There’s been a few questions as to where the Mojang team get their ideas from, as after player-made mods became popular, similar elements were in following patches. The patches made the game better, and with more to look forward to even after the games release, Mojang are more than likely going to continue pleasing the masses. You definitely don’t want to miss this, however you’ve probably jumped at the chance of getting it already. Minecraft provides a game that allows you to create your own game, your own experience and your own possibilities. I’ll refrain from an Inception quip. Just prepare yourself to be patient to build that masterpiece, and to give away a lot of your free time.